Firefighters who worked the site of the 9/11 attacks on the World Trade Center in New York have an extra-high risk of cancer, especially multiple myeloma, researchers reported Thursday. The two studies, which look only at white male firefighters, add another piece to the puzzle of what health risks are raised among 9/11 responders, but they don’t provide a definitive answer to the question. The researchers said the heavy dust of toxic chemicals that bathed just about everybody at the site, both during and in the months after the attacks, appears to be taking an especially heavy toll on first responders. They studied white, male firefighters with multiple myeloma and also screened a group of older firefighters for a condition that can lead to the blood cancer. “Our study shows that World Trade Center exposure may be a risk factor for the development of multiple myeloma and its precursor disease,” the team wrote in the report, published in the Journal of the American Medical Association’s JAMA Oncology. “We observe striking patterns,” Dr. Ole Landgren of Memorial Sloan Kettering Cancer Center in New York and colleagues added. “We found the median age of multiple myeloma diagnosis to be 57 years, which is roughly 12 years younger than what is seen nationally,” they added. They also found that more of the men than would otherwise be expected had a pre-cancerous condition called monoclonal gammopathy of undetermined significance (MGUS), which can progress to myeloma. But Dr. Otis Brawley of the American Cancer Society was cautious about assuming too much from the findings. “These trials, because of the size of cohort, cannot identify a small increase in cancer risk due to World Trade Center exposure, and correlation does not mean causation,” Brawley wrote in a commentary. The same team found in 2011 that firefighters had a higher risk of cancer — helping answer a question that had been fought out in the courts for years as first responders sought compensation and care for the after-effects of the disaster. “We wanted to find early, predictive signs of cancer that would allow us to screen people and monitor those found to be at risk. By detecting MGUS, which predicts the development of multiple myeloma, we are able to do that,” said Dr. David Prezant of the Albert Einstein College of Medicine, who worked on the study. They found 16 firefighters with multiple myeloma, which is about 1.8 times more than found in a similar population of white men in Rochester, Minnesota. The researchers also analyzed cancer cases to date among the firefighters, compared them to similar New Yorkers, and projected how many more cases of cancer might be expected. The firefighters are treated as part of the Fire Department of New York’s World Trade Center Health Program. “We project that the FDNY-WTCHP cohort will experience a greater cancer burden than would be expected from a demographically similar population,” the researchers wrote. It wasn’t a big increase — a projected 2,714 cases among white male firefighters, compared to 2,596 among similar white male New Yorkers. “Those who performed work at the WTC site may be at increased risk for prostate cancer, thyroid cancer, and melanoma owing to their exposure to carcinogens in the WTC dust,” the researchers wrote. It was widely expected that first responders and survivors of the attacks might have a higher cancer risk. “Many WTC first responders were initially exposed to aerosolized dust and toxic fumes from burning jet fuel and building materials,” the researchers wrote. This dust included pulverized cement, glass fibers, asbestos, lead, cancer-causing compounds called polycyclic aromatic hydrocarbons or PAHs, polychlorinated biphenyls or PCBs, polychlorinated furans and dioxins. “For the next 10 months of the rescue, recovery, and cleanup effort, responders were exposed to burning subterranean fires that released trapped gases and dust, and were not extinguished until the end of December,” the researchers wrote. The dust and chemicals could also cause chronic inflammation, which can lead to cancer, they said. Brawley said it’s a natural response to think so, but he is not convinced by the numbers in the studies. “The WTC attack is an emotional subject. Cancer is also an emotional subject,” he wrote. But Brawley also said the first responders deserved respect. “They should also be compensated for all the injuries associated with their service and given the best care possible,” he wrote. Close to 70,000 responders are enrolled in the World Trade Center Health Program, which provides monitoring and treatment for people involved in the 9/11 attacks. 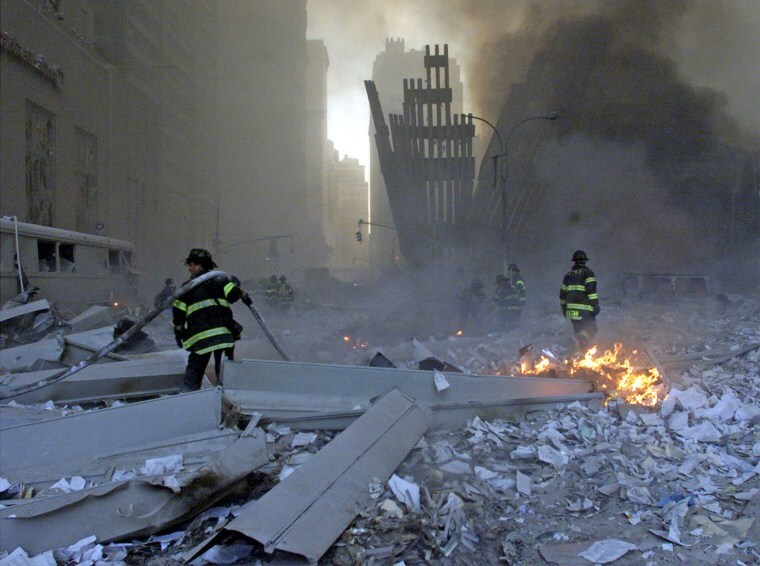 The attacks killed nearly 3,000 people, including more than 400 firefighters and other first responders. The researchers said all these people need continued careful surveillance and said the program needs to keep funding up to levels that can take care of them.